Depth 2 3/4" - 3 1/4"
This guitar is made with the same construction method that acoustic guitars have used for almost a hundred years, a spruce soundboard with X bracing. It is a proven technique that makes for a great sounding acoustic guitar. There are some changes though. 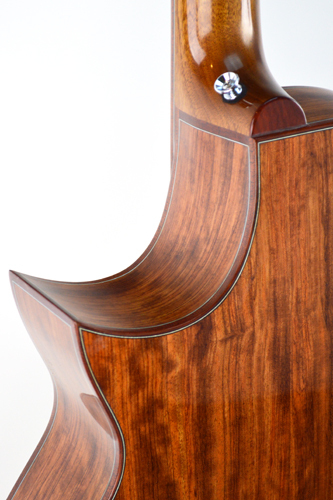 The body is smaller to make it more comfortable, and the sound hole on the front is gone and replaced by a side port that directs the acoustic sound towards the player. This also help to reduce feedback issues. The electronics can be custom designed to some extent. The lipstick tube electromagnet pickup is made by Kent Armstrong. 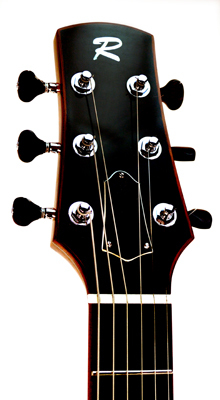 The acoustic pickup is the pure piezos made by K&K. Additions can be made like a L.R. Baggs Lyric microphone can be added to give more sparkle and air to the high end or an under saddle piezo can be added. 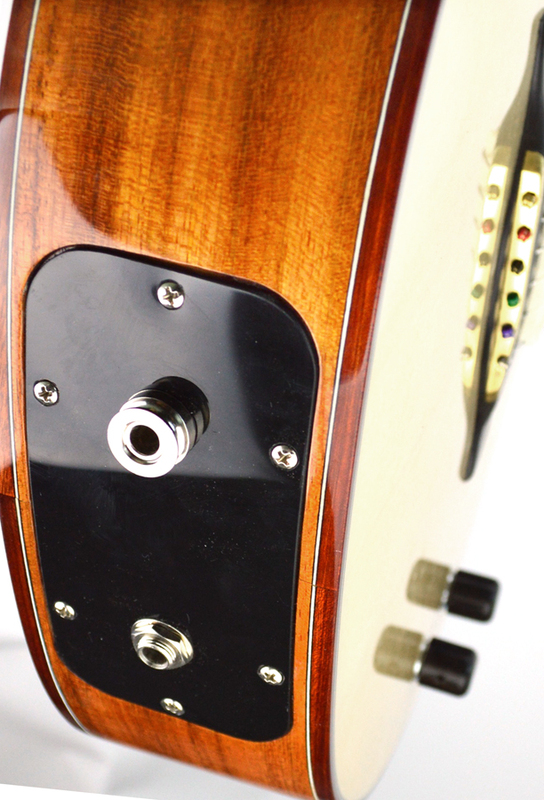 There is also an option to have a gold foil electro magnet pickup added in the bridge position. The piezos and microphone pickups are combined and sent to a stereo out put jack and the electro magnet pickup is sent to a seporate out put jack. 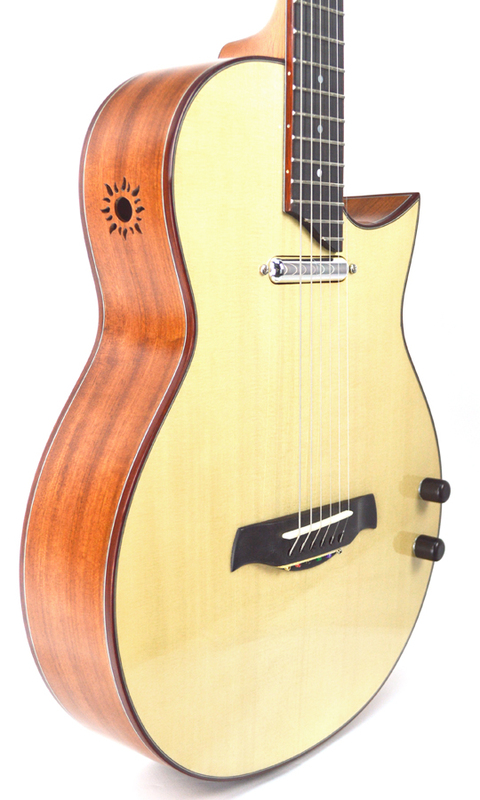 This guitar is great for the gigging musician who wants both an acoustic and an electric guitar in one instrument. It also works well for sampling an acoustic sound and then switching to an electric guitar sound and playing a solo over the sample track. Or it can be used for a stereo effect when both systems are used simultaneously pugged into two amps. Some players run both signals into one amp and blend all of the sounds to give a rich full sound. In the studio the sounds can be recorded to seporate tracks to be processed and blended. imminently playable! There is a precision to the sound. A great pleasure! You are really onto something here. This Librada guitar is fantastic. It is hands down the most comfortable guitar I have played! It is really going to make a difference for me - both due to the ease of playing and the tonal options this guitar offers. What a great design - a workhorse and a beauty!